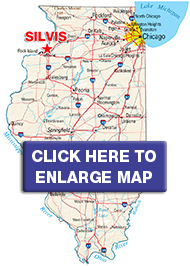 ﻿City of Silvis is located in Western Illinois just 4 miles from the intersection of the I-80 & I-88 interchange. Contiguous to East Moline and Moline; the larger populations that help comprise the Quad City area. Silvis is 165 mile west of Chicago, IL and 165 miles east of Des Moines Iowa. The location of Silvis allows for easy access to major metropolitan areas including Minneapolis, Omaha, Kansas City, St. Louis, Milwaukee and Indianapolis giving Silvis daily access to millions of people and thousands of businesses. So, available, is a rate media market with 308,910 TV households in a designated market area or 2.7% of United States. 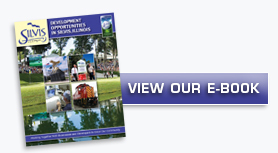 Silvis has properties available with access to both rail and interstate. Silvis also has access to two major medical centers that include a critical access center located in Silvis. Two community college districts, a Liberal Arts College, and a public university auxiliary campus along with two private universities and two extension services are in the area. A great place to raise a family. The cost of doing business in the Quad Cities is among the lowest in the nation, while our workforce exceeds national averages in quality, stability and productivity. More than 30,000 businesses, including Deere & Company World Headquarters, 3M, Alcoa, and the Rock Island Arsenal, a major military installation, are already In the Quad Cities. ﻿Silvis is on a growing edge of this bi-state area and will continue to be a City of Progress.